To demodulate analog TV AM/VSB modulated signal in analog implementation, usually, a special passband surface acoustic filter (SAW) VSB filter is utilized, and then the signal is shifted in spectral domain to the baseband using a frequency rotator. The SAW filter has to be standard specific since different analog standards have different spectral shapes. DSP allows the use of a more universal approach and, depending on the particular standard, is able to change the shape of the filter by changing the sampling frequency. 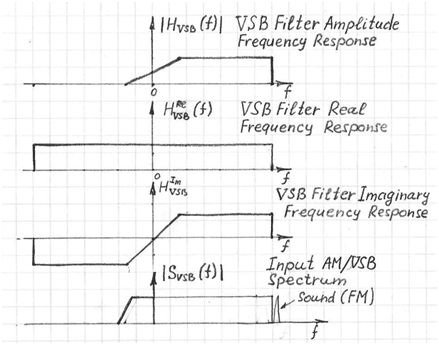 For DSP implementation, a complex VSB filter is utilized. First the signal has to be shifted in the spectral domain from intermediate frequency to the baseband using complex frequency rotator. Then, the rotator’s output complex signal has to be processed in the receiver with a complex VSB filter. The real part of this filter is a demodulated composite signal. The complex VSB filter is able to recover the proper composite signal only under the condition that the right frequency and phase of the rotator shifting carrier is estimated. Carrier frequency and phase are estimated by the Carrier Recovery System (Figure 1).